Practical, light and discreet. this product adds a very thin layer over any motorcycle jacket, but a big plus for the safety of the biker. Developed to fit over all motorcycle jackets, without losing any movement freedom. 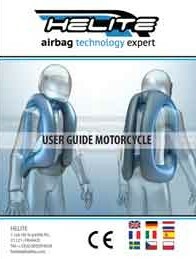 The Airnest is adjustable to be worn close to the body regardless of the thickness of the motorcycle jacket. The clips to close this jacket are sturdy and easy to handle even with gloves or stiffed cold hands. CE certified semi-rigid KNOX back protector. 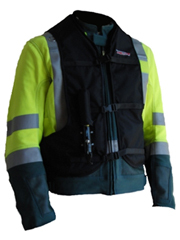 The Air Jacket worn over your jumper (rigid protection) or a garment (jacket, t-shirt, etc.). The straps can be adjusted at any time. This table is presented for information purposes, the aibag should stop at least 10 cm below the iliac crest (pelvic bone). You should only use the Helite brand cartridges developed specifically for our airbags. Attention, the minimum weight of the user must be 35kg. B. Measure horizontally around the fullest part of your chest, under the armpits with your motorcycle gear on. Waist line with equipment C. Measure horizontally around your abdominal, at its deepest body point with your motorcycle gear on. Hip line with equipment D. Measure the circumference, from pelvic bone to pelvic bone, at the widest part of your hips. Back length E. While standing upright, measure the distance between the lower neck and the tailbone. CO2 Cartridge The cartridge size must fit the airbag size.